Häagen-Dazs is ice cream that’s richer in taste and creamier in body to give you a longer slow-melting moment of pleasure. The value of the Haagen-Dazs Cash Voucher cannot be exchanged for cash. Loss or stolen Cash Voucher will not be replaced. During the redemption of goods, if the value of the goods exceeds the amount stated in the Cash Voucher, the difference thereof will be paid by the bearer. 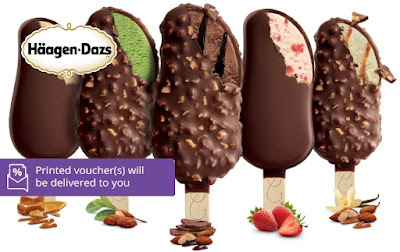 Haagen-Dazs Malaysia shall not be held responsible for the loss or damage of this Cash Voucher and any of the losses or damages suffered by the bearer of this gift card that arise from or in connection with the loss or damage of the Cash Voucher. Cash Voucher will be delivered 7 working days from the date of redemption. Damaged Cash Voucher will be considered as invalid Cash Voucher and will not be replaced. Cash Voucher cannot be exchanged for cash, or any other forms of legal tender. Cash Voucher are not refundable. Haagen-Dazs Cash Voucher reserves the right to vary and amend any of the above terms and conditions without prior notice. Cash Voucher purchased on 8excite are non-refundable unless stated otherwise.